In fact, it's lucky number 11! 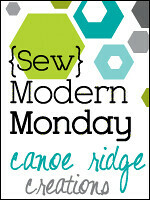 This week I am very excited to share with you all my Solids Film Strip Quilt Top. That is right, the top is complete! I started this quilt during last month's FNSI and officially wrapped it up this past weekend. One month isn't to bad, right? Like I mentioned before, I used my FQs I received from the Gen X Kona Your World Swap and paired them with Kona Coal (my go-to color these days). By the way, signups for Round 2 of the Kona Your World Swap are now open! Go check it out! ETA: The swap is now full. My design inspiration came from the Cherry House QAL quilt. Have you seen it? I really liked the basic, simple design of it but decided to add my own little twist. The finished top ended up being a hefty throw size, a tad bit bigger than the original QAL size. As far as quilting this puppy goes, my plan is to go with straight-line quilting running vertically between the colored rows using a cotton thread that matches the Kona Coal. That way the "optical illusion" of sorts will stand out. All righty folks, it is your turn. You know the drill! If you need a refresher, here are the rules. And as always, I love seeing new faces. So don't be shy and jump right in! WOOOOOWWWW! That is crazy good...I love the solids you picked and the white looks really good! Such a creative design! 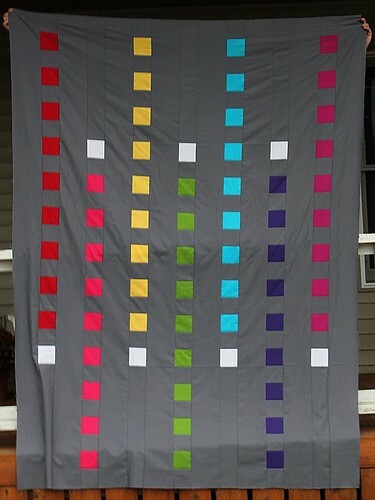 OH I love your filmstrip quilt! The colors are so cool. I love the white square at the end just like a roll of film, very clever! Megan your quilt top is really cool, understated and bold! Love that top! So cool! Nice use of solids. Thanks for hosting! Thanks so much for the plug Megan - but the Kona Swap filled up in just 2 days??!?! So unfortunately, it's full for now. Love with you did with your Kona FQs! Looks great with the Coal. Love the top! I can't wait to see how it looks all finished up! That top is so..so..great! I love anything with that Kona Coal! Can't go wrong with that! Have fun quilting it!